suddenly I see people using this card. In 1 ten games maybe two times compared to 0 times in 100 games 2 months ago. So what's the deal? are people just copying someones popular build on some forum or trying to imitate a twitch streamer of some sort? Ladder is cubelock (massive tempo loss if opponent plays skull and it's destroyed without even pulling out a demon once), paladin (truesilver, silver sword, vinecleaver, unidentified maul), face mage (aluneth). And if you find that rare warrior on ladder, they always run some weapon. Not to mention rogue or hunters. Fact is, is you're playing a slower deck, Harrison provides valuable draw, and there are so many weapons on ladder that it's worth running in the current meta. Only shaman, priest, and druid don't run weapons, and shaman is kind of dead and spiteful priest has been replaced by spiteful druid for the most part. Even then, priests and druid usually run the lich king, so you can still hope to destroy that. The Deal is people adopting and getting wise to the meta, Harrison is a tech card specifically for weapons... whats not to understand here? So guys, we're pretty well into the meta of Kobolds. Would we say Mr Jones succeeded in his job? I mean, I don't think many of the super meta decks even run the weapons? Is it because of Harrison? Or are the weapons just not used in most meta decks? I'll keep running him though, just in case. Should I craft this now? Opened one reg pack after the release expansion released just now and got this, almost dusted it then thought... wow. Keeper now. I knew it was a right idea to keep you Mr Jones. Get fucked Gluttonous Ooze! Harrison Jones is BACK! With the latest expansion to date, I think this card is an absolute must have : So many weapons have been added to the game and most are late game cards that players want to combo like Blood Razor and Rotface.. And for some aggro decks that blow off steam quite fast this is a good way to regain card advantage (considering your opponent plays a slower deck and has quite a few cards in had, which happens quite often now). Hello again. After all this time of silence I've finally decided to rewrite my old outdated reviews, so the first one of those will be Harrison Jones. Now,one year later, the situation regard weapons has changed a bit. Back in those days there were Doomhammers, Lord Jaraxxus's forks, Spirit Claws, Gorehowls as weapons you see in every second-third matchup. Removing such monstrosities was be a very huge tempo swing, as it basically removed 2-8 charges off weapon, while developing akind of solid body, that could contest board control. But it was like one year ago. What do we have now? Most weapons are played before Harrison Jones even playable in terms of mana, and by the time he is played, they have already worn off. Pirate warrior is the only deck that uses more than 1-2 weapons, but against those this card is VERY slow. their weapons have 2 charges, one of which is spent on your face right away, and even if they Upgrade! it, they still have 1 charge. And they have bunch of pirates on board. It's not affordable only to destroy a weapon for 5 mana. If you spend your turn 4-6 on such, it will do nothing. They might just equip another weapon,and still ve able to play more stuff on board. In such matchup Gluttonous Ooze, Acidic Swamp Ooze, or even Bloodsail Corsair, which also brings Patches the Pirate are better choices in terms of mana flexibility. For the difference of 3 mana you can heal, play a taunt or another creature to contest board, or play something else to help you hold up. Such turns make it better for you, as tempo is better than 5/4 that drows a card and removes 1 charge. Alright, Shaman. People are hyped about Doomhammer removal. No. Just no. This weapon is no longer a thing, as Rockbiter Weapon was nerfed, so shamans had stopped using it, same as Doomhammer itself. I havent seen this weapon in about half a year. THis is not the thing you see every shaman matchup, so dont worry about it. Spirit Claws got nerfed as well,so most of shmans had refused to use this too. Typical weapon we see is Jade Claws. Still only 2 charges, but some slower shamans might hold up both charges, if you have nothing they can kill on board. In this case drowing 2 cards and playing 5/4 would be somewhat valueable, but keep in bind spell damaged Lightning Bolt, Jade Lightning, that can kill your Harrison and develop higher tempo. Hunters dont play many secrets, so the time when they could have 3-4 charged Eaglehorn Bow has passed. Still 1 charge costly removal issue I'm talking about. Paladins still run Tirion Fordring. Moreover, they seem to like Stonehill Defender, which help them discover one or two additional Tirions, and N'Zoth, the Corruptor still resummons them. 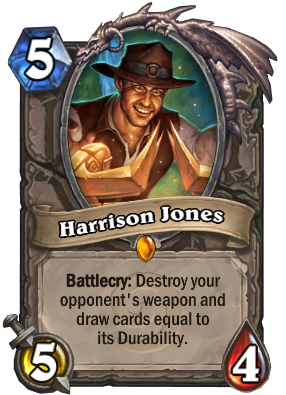 In such matchups Harrison Jones does not seem as a slow card, and chance of drawing him when your opponent has Ashbringer equipped is significantly higher. Also, drawing 1-2 cards(they always swing at least 1 time just to push damage and avoid full value of stuff like Acidic Swamp Ooze, which is kinda popular). So in such matchups Jones is a good tech. But it's the only matchup, and Paladin is not that top tier deck everybody would play. There is some diversities in Priest, Mage and Warlock decks, that try to use Medivh, the Guardian, but it's single exeption rather than a rule. So counting on that in these matchups and hold Harrison just to have a chance to remove Atiesh is pointless, if it costs you tempo loss. So, which decks would play Harrison Jones rather than Oozes and pirates? I may suppose, druids. They have Innervates to enlarge mana poolfor high tempo swings, they dont have that good draw sources, and still have troubles with answers. But, honestly, Druid of the Claw would make it better, as 6 health is more than most of weapons' attacks, so additional spell/minion would be required to pass throuh it, it can be played on full board, or an empty board with no tempo loss, and overall better. It doesn't draw cards situationally, though. The purpose of these cards are different, i agree, but keep in mind that druid has some 5-mana cards that he often uses, so addition of even more of those can negatively impcat your curve and tempo, unless you run heavy ramp cards. Mages could play that, as they have Ice Block, Ice Barrier that they play usually before turn 5, and they appreciate draw for further tools or sustain measures. But i still see no mages who would play Harrison Jones. So, in conclusion, I would make a statement that this card is not that important. It potentially looks very cool and excititng. This thing forced me to craft it just for my collection, and i had been using it, but then stopped due to realising it was kinda slow. I found better tools overall in my decks. So, Do you craft it? No, unless you want to complete expert set legendaries. Do you dust it? Probably not. There might be an expansionthat changes the meta, bringing cool weapons and slowing things down, but at the current moment, and past times we haven't seen this card beind demandful that much. P.S. Here is my old review, that was written 1 year ago(almost perfectly). You can read this if you are curious how he was doing in past. Well met. This is time for next review, and today we are getting closer look on Harrison Jones. There will be no backstories, because I dont personally have that card, but I've still got stuff to say about him. So, in this observation I will often compareHarrison Jones with Acidic Swamp Ooze, because these two cards have the same purpose, but different ways to deal so. Let's talk about his positive sides first. It's a 5/4 for 5 mana with weapon removing + drawing abiity. Basically, for 2 pionts of stats you vaporise your opponent's scissors and draw 1-8 cards. Usualy it's 1-2, as most weapons(Truesilver Champion, Fiery War Axe, Rallying Blade, etc) have 2-3 durabiity, and when opponent plays it he instantly attacks. Sometimes it's not the case, though, so you get an extra card. In mid game it is useful, because you get rid of weapon, drop a medium treat and draw cards. So most of the time he will be handy, but not always. In current meta we have a ot of weaponry in matches, because of warriors, paladins, rogues, SHAMANS, damn them. So you are most likely to find a targt for Harrison Jones' battlecry during these matchups. In late game, when you are out of cards in hand, and go toe-to-toe with your enemy, removing a weapon with card draw puts you in good favour, unless you're loosing the game horribly. Now, it's time to cover his dark sides. And compare him with Accidic Swamp Ooze, So, they have the same purpose, but different mana cost, so this is a really big deal. In early game, if your opponent play, lets say, Truesilver Champion on turn 3-4, your Harrison Jones is 5 mana, so it means you won't wait untill weapon is still in play. At this point, Acidic Swamp Ooze allows you to get rid of weapon, and then use remained mana for, lets say, 1-3 mana minion/spell or hero power. So summary tempo may be higher with 2 cards played. Anoher issue is playing against shamans. If he gets his Doomhammer at 5-7 mana, you will draw 6 cars out of HJ's battlcery. If you are midrange or contro deck, by turn 5-7 you will have around 5 cards. If your start was horrible, you will have around 7 cards, so draing 6 more means you wil mill yourself 4 cards. But yeah, you remove your opponent's OP weapon. But he will have board to deal with Harrison Jones. and hey you are most likely to lose, unless you have very powerful 6-7 mana mass-removal/combo to remove his board. In that cas you have a chance of winning. So, that was early-mid game. Now lets talk about late game. His manacost makes it impossible to play him and something big. Like, if you had Ooze, you would kill a weapon, then drop Ragnaros the Firelord / Sylvanas Windrunner / Black Knight / Ancient of War or any other 6-8 mana minons/spells. Harrison Jones would restrict you to 5 mana pool, and you most likely to hero power or something like 1-5 mana stuff. Also, in late game, drawing a lot of card puts you closer to fatigue, so you should mention that if you removing Doomhammer or [cardBlood Fury][/card], if you meet heavy warlocks/shamans. Athough, you can wait utill weapons drops its durabiity to your lacking-card amount, but it means your board/face will suffer X amount of damage thet could have been prevented with 2 mana basic card. Time to make a conclusion. This card is good in current weapon meta, but not must-to-have, since Acidic Swamp Ooze is a basic card, accessable to anybody. If you have a midrange-control deck, you have choice to use one of those cards, consdering what you prefer more - better tempo or better card draw. Removing Doomhammer, Gorehowl or other strong weapons is good, but you shoud choose, wether to put a 2 mana tech, or 5 mana with sometimes negative value card draw. If you get Harrison Jones from a pack, you have the real choice of dusting it. If you really need 400/1600 dust for something useful - dust him. If not - you can remain him in your collection. I woud not recommend you to craft him ,as Accidic Swamp Ooze is a good replacement. You better choose from other staple neutral/class legendaries. Nowadays Indiana Ford is not widely played, he persists in 4-6% of all decks. harrison>doomhammer almost milled my reno but still one of my fav cards especially in this meta. I think this is perfect for Jade Druids, instead of using the Ooz that everyone recommends. Just Immagine Destroying a Doomhammer and drawing who knows how many Jade Idols from your deck, I think it Synergies a lot better than the Ooz does in a Jade Druid deck. also if you w need to play it early you will probably already have the mana since ideally you have already used a Jade Blossom or a Wild Growth, or you probably have an Innervate in your hand. This card has been everywhere in the past few weeks. I understand why (Midrange Shaman and Spirit Claws), but man does he get annoying to play against after the tenth time he puts your Gorehowl or Atiesh or Ashbringer in a museum. Regardless, very solid card.